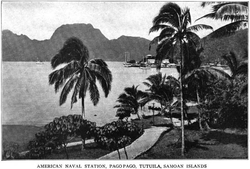 From 1878 to 1951, it was a coaling and repair station for the U.S. Navy, known as US Naval Station Tutuila. 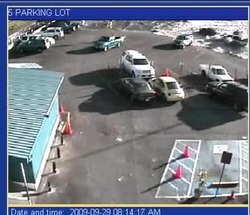 Security camera footage of the 2009 tsunami surging through a parking lot. Bird's-eye view of the coast of Pago Pago. 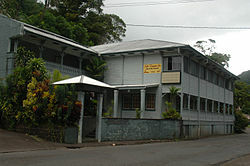 The Fono (legislature) is located in Fagatogo, which is the center of town. Utelei and Maleimi are home to some Pago Pago-based hotels. Satala and Atu'u are home to Pago Pago's tuna industry. Tafuna is the location of the Pago Pago International Airport, 7 miles south of Pago Pago. Pago Pago is the primary entry point for visits to National Park of American Samoa, and the city is situated immediately south of the park. Its park visitor center is located at the head of Pago Pago Harbor: Pago Plaza Visitor Center (Pago Plaza, Suite 114, Pago Pago, AS 96799). This center also contains a collection of Samoan artifacts, corals, and seashells. 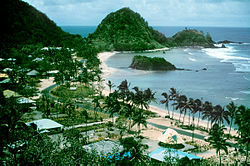 The nearest hotels to the national park are also located in Pago Pago. Other parts of the park, on the islands of Ta‘ū and Ofu, can be visited via commercial inter-island air carrier from Pago Pago International Airport. A statue of StarKist Tuna mascot "Charlie the Tuna" at the company cannery in Atu'u. Pago Pago International Airport is located at Tafuna, 8 miles southwest of Pago Pago. Polynesian Airlines operates shuttles between Apia and Pago Pago 4-7 times daily. 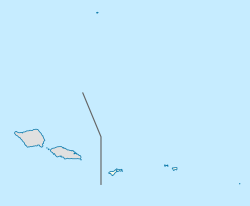 Most flights are to and from Fagali'i. Of the 88,650 international arrivals in 2001, only 10 percent were tourists. The rest came to visit relatives, for employment reasons, or in transit. Most international visitors are from the independent country of Samoa. There are international flights to Samoa from Pago Pago International Airport (PPG):  Pago Pago is a 35-minute flight from Apia in Samoa. There is only one flight destination from the territory to the United States: Honolulu International Airport, a five-hour flight from Pago Pago. Scheduled intra-territorial flights are available to the islands of Ta‘ū and Ofu, which take 30 minutes by air from Pago Pago. A ship called MV Lady Naomi runs between Pago Pago and Apia, the capital of Samoa, once a week. 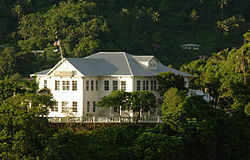 Government House in the Togotogo Ridge appears on the National Register of Historic Places. The Aerial Tramway at Mount Alava is one of the world's longest single-span cablecar routes. It begins atop Solo Hill at the end of the Togotogo Ridge above ‘Utulei. It ascends 1.1 miles (1.8 kilometers) across Pago Pago Harbor and lands at the 1,598 ft (487 m) Mount ‘Alava. It was constructed in 1965 as an access to the TV transmission equipment on the mountain. Rain (1921) by W. Somerset Maugham is set in Pago Pago. 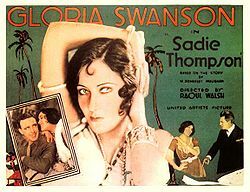 Movie adaptions include Sadie Thompson (1928), Rain (1932), and Miss Sadie Thompson (1953). A jungle village resembling Pago Pago was created for motion picture in Two Harbors, Catalina Island, CA. Several Sadie Thompson films were shot here. Lost and Found on a South Sea Island (1923) is set in Pago Pago. Next Goal Wins (2014), British documentary filmed in Pago Pago. In the Sweet Pie and Pie (1941), The Three Stooges short. Pago Pago is mentioned as being one of the locations for the fictional Heedam Neckties stores. Peter T. Coleman was the first Governor of Samoan descent. ^ "Geographic Names Information System". United States Geological Survey. Retrieved January 31, 2008. ^ a b c d Harris, Ann G. and Esther Tuttle (2004). Geology of National Parks. Kendall Hunt. Page 604. ISBN 9780787299705. ^ a b United States Central Intelligence Agency (2016). The World Factbook 2016–17. Government Printing Office. Page 19. ISBN 9780160933271. ^ Grabowski, John F. (1992). U.S. Territories and Possessions (State Report Series). Chelsea House Pub. Page 52. ISBN 9780791010532. ^ Kristen, Katherine (1999). Pacific Islands (Portrait of America). San Val. Page 12. ISBN 9780613032421. ^ Leonard, Barry (2009). Minimum Wage in American Samoa 2007: Economic Report. Diane Publishing. Page 11. ISBN 9781437914252. ^ Leonard, Barry (2009). Minimum Wage in American Samoa 2007: Economic Report. Diane Publishing. Page 61. ISBN 9781437914252. ^ a b Stanley, David (1993). South Pacific Handbook. David Stanley. Page 353. ISBN 9780918373991. ^ Smith, Andrew F. (2012). American Tuna: The Rise and Fall of an Improbable Food. University of California Press. Page 164. ISBN 9780520954151. ^ Kristen, Katherine (1999). Pacific Islands (Portrait of America). San Val. Page 29. ISBN 9780613032421. ^ Mack, Doug (2017). The Not-Quite States of America: Dispatches From the Territories and Other Far-Flung Outposts of the USA. W.W. Norton & Company. Page 62. ISBN 9780393247602. ^ a b Lal, Brij V. and Kate Fortune (2000). The Pacific Islands: An Encyclopedia, Volume 1. University of Hawaii Press. Page 101. ISBN 9780824822651. ^ a b Lonely Planet. "Rainmaker Mountain in Tutuila". Lonely Planet. Retrieved November 28, 2017. ^ "American Samoa Is The Empty Slice Of Bliss You've Been Craving". huffingtonpost.com. Retrieved November 28, 2017. ^ a b c Cruise Travel Vol. 2, No. 1 (July 1980). Lakeside Publishing Co. Page 60. ISSN 0199-5111. ^ "Uber, schmuber. Behold the buses of Pago Pago ..." LA Times. Retrieved November 28, 2017. ^ Stahl, Dean A. and Karen Landen (2001). Abbreviations Dictionary. CRC Press. Page 1451. ISBN 9781420036640. ^ Freeman, Donald B. (2010). The Pacific. Routledge. Page 167. ISBN 9780415775724. ^ Levi, Werner (1947). American-Australian Relations. University of Minnesota Press. Page 73. ISBN 9780816658152. ^ Dixon, Joe C. (1980). The American Military and the Far East. Diane Publishing. Page 139. ISBN 9781428993679. ^ Stanley, George Edwards (2005). The Era of Reconstruction and Expansion (1865–1900). Gareth Stevens. Page 36. ISBN 9780836858273. ^ Pafford, John (2013). The Forgotten Conservative: Rediscovering Grover Cleveland. Regnery Publishing. Page 61. ISBN 9781621570554. ^ Rottman, Gordon L. (2002). World War II Pacific Island Guide: A Geo-military Study. Greenwood Publishing Group. Pages 84-85. ISBN 9780313313950. ^ a b c "Pago Pago | American Samoa". Britannica.com. Retrieved November 28, 2017. ^ Carpenter, Allan (1993). Facts about the Cities. Wilson. Page 11. ISBN 9780924208003. ^ "NFS Form 10-900-a OMB Approval No. 1024-0018 | Thompson, Sadie, Building, Eastern AS" (PDF). National Register of Historic Places. February 2, 2009. Retrieved November 28, 2017. ^ Labor, Earle (2013). Jack London: An American Life. Farrar, Straus and Giroux. Page 272. ISBN 9781466863163. ^ Rottman, Gordon L. (2002). World War II Pacific Island Guide: A Geo-military Study. Greenwood Publishing Group. Pages 85-86. ISBN 9780313313950. ^ Rill, James C. (2003). A Narrative History of the 1st Battalion, 11th Marines During the Early History and Deployment of the 1st Marine Division, 1940–43. Merriam Press. Page 32. ISBN 9781576383179. ^ "David Huebner - US Ambassador to New Zealand". web.archive.org. Archived from the original on February 27, 2013. Retrieved November 28, 2017. ^ "samoanews.com/local-news/dedication-va-clinic-centerpiece-vp-pence-visit-amsam". samoanews.com. Retrieved November 28, 2017. ^ "Apollo At American Samoa Summary". members.tripod.com. Retrieved November 28, 2017. ^ "Kevin Steen". history.nasa.gov. Retrieved November 28, 2017. ^ "Jean P. Haydon Museum Review | Fodor's Travel". fodors.com. Retrieved November 28, 2017. ^ "Lyndon B. Johnson: Remarks Upon Arrival at Tafuna International Airport, Pago Pago, American Samoa". presidency.ucsb.edu. Retrieved November 28, 2017. ^ "1968 Annual Report: American Samoa" (PDF). July 22, 2011. Retrieved November 28, 2017. ^ Cassidy, Edward Idris (2009). My Years in Vatican Service. Paulist Press. Page 52. ISBN 9780809145935. ^ "Pence cutting Pacific trip short". POLITICO. Retrieved November 28, 2017. ^ "Mike Pence cuts short his stop in Hawaii to deal with domestic issues". CBS News. Retrieved November 28, 2017. ^ "american samoa". americansamoa.gov. Retrieved November 28, 2017. ^ " Disaster aid flows to tsunami-hit Samoas". MSNBC. ^ Jadacki, Matt (2011). American Samoa 2009 Earthquake and Tsunami: After-Action Report. DIANE Publishing. Page 2. ISBN 9781437942835. ^ Dunbar, Paula K. (2015). Pacific Tsunami Warning System: A Half Century of Protecting the Pacific, 1965–2015. Government Printing Office. Page 56. ISBN 9780996257909. ^ a b "Pago Pago, American Samoa: The Capital City on the Harbor". visittheusa.com. Retrieved November 28, 2017. ^ "Port of Pago Pago - American Samoa | Department of Port Administration". americansamoaport.as.gov. Retrieved November 28, 2017. ^ " Pago Pago (American Samoa)". Britannica Online Encyclopedia. ^ Ruffner, James A. and Frank E. Bair (1987). Weather of U.S. Cities: City Reports. Gale Research Company. Page 840. ISBN 9780810321021. ^ a b "Pago Pago International Airport (PPG) - American Samoa | Department of Port Administration". americansamoaport.as.gov. Retrieved November 28, 2017. ^ "Pago Pago, capital city of American Samoa". visitcapitalcity.com. Retrieved November 28, 2017. ^ McDonald, George (1994). Frommer's Guide to the South Pacific, 1994–1995. Prentice Hall Travel. Page 262. ISBN 9780671866600. ^ Goodwin, Geoge McDonald (1994). Frommer’s Guide to the South Pacific, 1994–1995. Prentice Hall Travel. Page 258. ISBN 9780671866600. ^ Lonely Planet Publications (1990). Samoa, Western & American Samoa. Lonely Planet Publications. Page 141. ISBN 9780864420787. ^ National Geographic (2016). National Geographic Guide to National Parks of the United States. National Geographic. Page 319. ISBN 9781426216510. ^ National Geographic Society (2012). National Geographic Guide to National Parks of the United States. National Geographic Books. Page 233. ISBN 9781426208690. ^ Smith, Darren L. and Penny J. Hoffman (2001). Parks Directory of the United States. Omnigraphics. Page 70. ISBN 9780780804401. ^ Stanley, David (2004). Moon Handbooks South Pacific. David Stanley. Page 479. ISBN 9781566914116. ^ Moker, Molly (2008). America's National Parks: Complete Coverage of All 391 National Parks, Including Scenic Trails, Battlefields, and Other Historic Sites. Fodor's Travel Pub. Page 429. ISBN 9781400016280. ^ Harris, Ann G. and Esther Tuttle (2004). Geology of National Parks. Kendall Hunt. Page 603. ISBN 9780787299705. ^ Goldin, Meryl Rose (2002). Field Guide to the Sāmoan Archipelago: Fish, Wildlife, and Protected Areas. Bess Press. Pages 273-274. ISBN 9781573061117. ^ Butcher, Russell D. and Lynn P. Whitaker (1999). National Parks and Conservation Association Guide to National Parks: Pacific Region. Globe Pequot Press. Page 82. ISBN 9780762705733. ^ Corlew, Kati (2015). Sauniuniga mo Puapuaga ma Suiga o le Tau i Amerika Sāmoa (in Samoan language). East-West Center. Pages 3-5. ISBN 9780866382601. ^ a b "NOWData - NOAA Online Weather Data". National Oceanic and Atmospheric Administration. Retrieved November 22, 2012. ^ U.S. National Park Service (1997). National Park of American Samoa, General Management Plan (GP), Islands of Tutulla, Ta'u, and Ofu: Environmental Impact Statement. United States National Park Service. Page 102. ^ Rustad, Martha E. (2010). The Wettest Places on Earth. Capstone. Page 6. ISBN 9781429639668. ^ Stanley, David (1993). South Pacific Handbook. David Stanley. Pages 350-351. ISBN 9780918373991. ^ McColl, R.W. (2014). Encyclopedia of World Geography, Volume 1. Infobase Publishing. Page 29. ISBN 9780816072293. ^ "library/publications/the-world-factbook/geos/print_aq". cia.gov. Retrieved November 28, 2017. ^ " Contact Us". Feleti Barstow Public Library. Retrieved May 19, 2010. ^ " History." Feleti Barstow Public Library. Retrieved May 19, 2010. ^ Lonely Planet. "Fagatogo Market in Tutuila". Lonely Planet. Retrieved November 28, 2017. ^ Brillat, Michael (1999). South Pacific Islands. Hunter Publishing, Inc. Page 136. ISBN 9783886181049. ^ "AGING WELL IN AMERICAN SAMOA". The New York Times. Retrieved November 28, 2017. ^ Goodwin, George McDonald (1994). Frommer's Guide to the South Pacific, 1994–1995. Prentice Hall Travel. Page 205. ISBN 9780671866600. ^ Harssel, Jan van and Richard H. Jackson (2014). National Geographic Learning's Visual Geography of Travel and Tourism. Cengage Learning. Page 526. ISBN 9781305176478. ^ Moos, Grant. 1980 . "April 17, 1980: Fiery crash halts Flag Day". Samoa News, April 18, 1980 (reprinted in the Samoa News, January 22, 1997: 4). Cited in Sorensen, Stan, and Joseph Theroux. The Samoan Historical Calendar, 1606–2007 Archived 2009-02-27 at the Wayback Machine. p. 93. ^ "American Samoa plans cable car revival". Radio New Zealand News. Retrieved November 28, 2017. ^ Stanley, David (2004). Moon Handbooks South Pacific. David Stanley. Pages 483-485. ISBN 9781566914116. ^ "Pago Pago Harbor, American Samoa". American Samoa Tourism. Retrieved November 28, 2017. 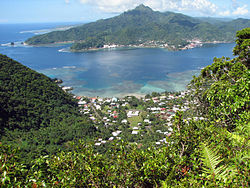 ^ "American Samoa Targets Expedition Market - Cruise Industry News | Cruise News". cruiseindustrynews.com. Retrieved November 28, 2017. ^ "American Samoa Cruises". USA Today. Retrieved November 28, 2017. ^ Stanley, David (1999). South Pacific Handbook. Moon Handbooks. Page 438. ISBN 9781566911726. ^ Pocock, Michael (2013). The Pacific Crossing Guide: RCC Pilotage Foundation with Ocean Cruising Club. Bloomsbury Publishing. Page 71. ISBN 9781472905260. ^ McColl, R.W. (2014). Encyclopedia of World Geography, Volume 1. Infobase Publishing. Page 28. ISBN 9780816072293. ^ Creason, Pam (1993). Geography. Page 588. ISBN 9780890843772. ^ "Welcome". ncl.com. Retrieved November 28, 2017. ^ "Princess Cruises : Pago Pago, American Samoa". princess.com. Retrieved November 28, 2017. ^ "Thirteen cruise ships to visit American Samoa". Radio New Zealand News. Retrieved November 28, 2017. ^ Stanley, David (2004). Moon Handbooks South Pacific. David Stanley. Page 512. ISBN 9781566914116. ^ Stanley, David (2004). Moon Handbooks South Pacific. David Stanley. Pages 468-469. ISBN 9781566914116. ^ "Port Information - American Samoa | Department of Port Administration". americansamoaport.as.gov. Retrieved November 28, 2017. ^ "Planning a Trip in American Samoa | Frommer's". frommers.com. Retrieved November 28, 2017. ^ Grabowski, John F. (1992). U.S. Territories and Possessions (State Report Series). Chelsea House Pub. Page 54. ISBN 9780791010532. ^ Swaney, Deanna (1994). Samoa: Western & American Samoa: a Lonely Planet Travel Survival Kit. Lonely Planet Publications. Pages 167-169. ISBN 9780864422255. ^ Swaney, Deanna (1994). Samoa: Western & American Samoa: a Lonely Planet Travel Survival Kit. Lonely Planet Publications. Page 167. ISBN 9780864422255. ^ Moss, Marilyn (2011). Raoul Walsh: The True Adventures of Hollywood's Legendary Director. University Press of Kentucky. Page 101. ISBN 9780813133942. ^ Stanley, David (2004). Moon Handbooks South Pacific. David Stanley. Page 463. ISBN 9781566914116. ^ Cruise Travel Vol. 2, No. 1 (July 1980). Lakeside Publishing Co. Page 61. ISSN 0199-5111. ^ a b American Film Institute (1993). The American Film Institute Catalog of Motion Pictures Produced in the United States, Volume 1. University of California Press. Page 1111. ISBN 9780520079083. ^ Reyes, Luis and Ed Rampell (1995). Made in paradise: Hollywood's films of Hawai'i and the South Seas. Mutual Pub. Page 1940. ISBN 9781566470896. ^ Fleming, E.J. (2008). Paul Bern: The Life and Famous Death of the MGM Director and Husband of Harlow. McFarland. Page 73. ISBN 9780786452743. ^ Capace, Nancy (1999). Encyclopedia of California. North American Book Dist LLC. Page 399. ISBN 9780403093182. ^ Hunter, James Michael (2013). Mormons and Popular Culture: The Global Influence of an American Phenomenon. Literature, art, media, tourism, and sports. Volume 2. ABC-CLIO. Page 237. ISBN 9780313391675. ^ "About". gstproductions.com. Retrieved November 28, 2017. Wikimedia Commons has media related to Pago Pago.